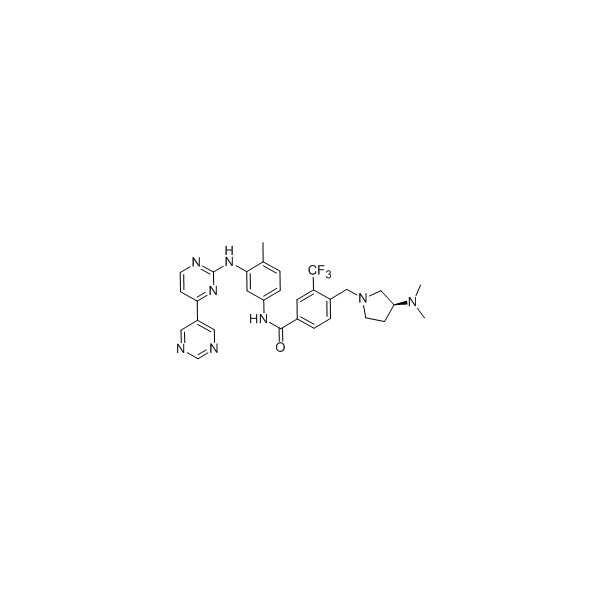 Background: INNO 406 is an orally bioavailable dual Bcr-Abl and Lyn kinase inhibitor with anti-CML efficacy; orally bioavailable; more potent (>10 times) than Imatinib; highly recommended Abl inhibitor in treating chronic myeloid leukaemia (CML). A Yokota et al. INNO-406, a novel BCR-ABL/Lyn dual tyrosine kinase inhibitor, suppresses the growth of Ph+ leukemia cells in the central nervous system, and cyclosporine A augments its in vivo activity. Blood, 2007, 109(1), 306-314. H Kantarjian et al. Phase 1 study of INNO-406, a dual Abl/Lyn kinase inhibitor, in Philadelphia chromosome-positive leukemias after imatinib resistance or intolerance. Cancer, 2010, 116(11), 2665-72. JC Uitdehaag et al. A guide to picking the most selective kinase inhibitor tool compounds for pharmacological validation of drug targets. Br. J. Pharmacol. 2012, 166, 858–876.